Ask fellow campers about "Apache Family Campground & Pier" and nearby attractions. Easy check in, friendly staff. Nice pier. At the time we camped the general store was still closed for the season and the pool was getting ready to open in a few weeks. Mostly full timers at this campground. We camped at Apache Family Campground & Pier in a Fifth Wheel. Tanger Outlets just outside the campgrounds, lots of shopping. Although they list 700 sites, many are filled by park models or semi-permanent residents. It seems that they try to hold some of the locations closest to the ocean for transient campers which is nice. This park is EXTREMELY tight and if the lot directly across from us had been occupied, we never would have gotten our 30' TT into the site. The day we pulled out, we needed to ask another camper to move his PU so that we could hook up and pull out. If you park carefully, you should have room for both awning and slideout. Access to the beach is very good and our site was very close to the ocean. We did not visit the pier this trip but have enjoyed a very nice Sunday service on past visits. We camped at Apache Family Campground & Pier in a Travel Trailer. Beach campsite with cement pad. Very close to the Apache Pier. Nice restaurant and bait shop, live music and bar. Loved walking the beach at night. Wi-fi was terrible but plenty of other things to do. Bath house is old but very clean. Can't wait to go back. We camped at Apache Family Campground & Pier in a Motorhome. Two campgrounds in the area were full for the weekend but we did find a space at Apache. To say it's tight is an understatement. The gal checking us in told us to turn at the wrong street so we had to back into our site. Fortunately there was an empty lot in front so we were able to make it. If it was more crowded, forget it. I should have looked more carefully at the diagram map before turning down the road. The space between sites once the slides are out is minimal. There are picnic tables and the sites nearer the beach do have covered tables. WSE all fine and surprisingly the Wifi is good as there are many permanent units as well as the transients. The attractions at the CG are the beach and the pier so for that you have to sacrifice space. Personal golf carts are permitted as well as rentals. The location is close to places we like to eat and the Grande Dunes golf course so we would return even with the close quarters. There is a lovely church service on Sunday on the pier. Have never been to church over the ocean before. Lots of activities for the kids as well as a nice pool.We're in a 45' motorhome. We camped at Apache Family Campground & Pier in a Motorhome. Croakers Restaurant on the pier is a good restaurant for fried shrimp. Flounder also looked good. Disconnect before going to look for your site. We come here often and this was the first time this year. Pier is still being worked on after the hurricane last year,but is open and usable. Campground is in great shape and pool, store,etc is all fine. This was the first time we had a front row site and it was awesome, very spacious. Water, electric and sewer were all good and all Beach sites have nice covered picnic table. We camped at Apache Family Campground & Pier in a Motorhome. Be sure to eat at Croakers on the pier. They have Great food and reasonably priced. There is a really good produce stand that is within walking distance of the front entrance. There is also a bar called Cool McFinns within walking distance (across from produce stand) that serves great food all day long including Breakfast. Walmart and Tanger Outlet are 3 miles down the road. Park is clean & quiet. The staff were all extremely helpful from the moment we arrived to the moment we left. The bathhouse facilities were clean and well-maintained. We camped at Apache Family Campground & Pier in a Travel Trailer. 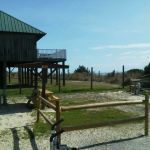 Campground is convenient to Hwy(s) 22/31 & 17 so the entire Grand Strand is accessible. It is tucked away in the middle of the NMB area so you have to pull through some congested traffic at times to get to it. NOTE: When approaching from 17 on Lake Arrowhead Rd, take the "not-very-well marked" corner entrance at the intersection of Kings Rd and Lake Arrowhead Rd. It makes it A LOT easier to get your RV into the park. Hope this helps. This is a busy place, site was just wide enough for our trailer and tow vehicle. Cable has many channels to pick from, wifi is strong. The park does need some TLC, but we were five sites away from the ocean - so really didn't care. Lots of golf carts zipping around, loved the garbage pick up ever day at each site. We camped at Apache Family Campground & Pier in a Travel Trailer. Stayed in the middle of the park in the shaded area. All utility connections are at the back of the site. Walked down to the pier a few times and the park is large. A lot of golf carts driving around. Sites are very close together and roads are narrow. We camped at Apache Family Campground & Pier in a Travel Trailer. Great location to the beach and pier. Cabana covered picnic area at each site. Very busy, very crowded, campers checking in and out at all hours. Peace and quiet are a premium. Golf carts are everywhere and lots of dogs. Close to shopping and tons of restaurants. We camped at Apache Family Campground & Pier in a Motorhome. Have stayed here a few times over the last 10 years and each time it seems that my experience is a little worse. Very cramped camp sights, several times I left my f250 in the overflow lot at the main gate cause the camping area is just to tight. I had to ask people to move there vehicles so I could set up my camper and so I could hook up and leave. I asked the office staff if I could extend my stay by 1 more day and they said I would have to move my camper to another spot... I said no thanks. Beach access and being close to a grocery store and walmart are about the only positives I can say. 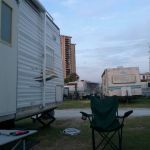 We camped at Apache Family Campground & Pier in a Travel Trailer. Location can't be beat. Steps away from the beach and a great pier to enjoy in the evenings. We were packed in there but everyone around us was friendly. Cable, Wi-Fi (not free) and hookups were good. We camped at Apache Family Campground & Pier in a Fifth Wheel. Very crowded park; especially, if you are next to a site that has a long 5th Wheel and 2 pick up trucks. People smoke everywhere. On the beach, in their campsite, in and around their pool. Just be ready to make adjustments if you are not a fan of cigarette smoke. The campground itself is OK. Not sure if it was the wind or the mass amount of people but there was trash (plastic bottles, wrappers..etc) everywhere. We camped at Apache Family Campground & Pier in a Motorhome. This campground is extremely crowded and all the sites are very close together! That said, if you want to camp very close to the ocean, then this is your place. 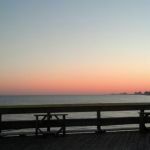 We did enjoy our stay because of our location and had fun visiting the pier each night. The staff were super nice and friendly and we really did feel like a welcomed guest. But if you are looking for a little space and less people, this probably isn't the place to stay. We camped at Apache Family Campground & Pier in a Motorhome. Stayed here while passing through. Had stayed here in the past and had a problem with the messes dogs would leave every where. Glad to see they have a new policy, but saw they didn't enforce it. Seen many dog owners walk away when their dog finished their business. Ordered propane from the front desk when we checked in. We were told it would arrive between 11 and 1 the next day. Waited around till 2 and called the office. The truck had been delayed and would not be there till the next day. Even in the off season, the golf carts are everywhere. If you are out walking, get out of their way. Not sure if we will stay here again. We camped at Apache Family Campground & Pier in a Motorhome. Well maintained, easy access, level spaces, great laundry facilities. Would return. 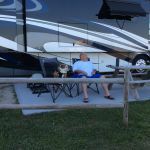 We camped at Apache Family Campground & Pier in a Motorhome. Are you affiliated with Apache Family Campground & Pier ?